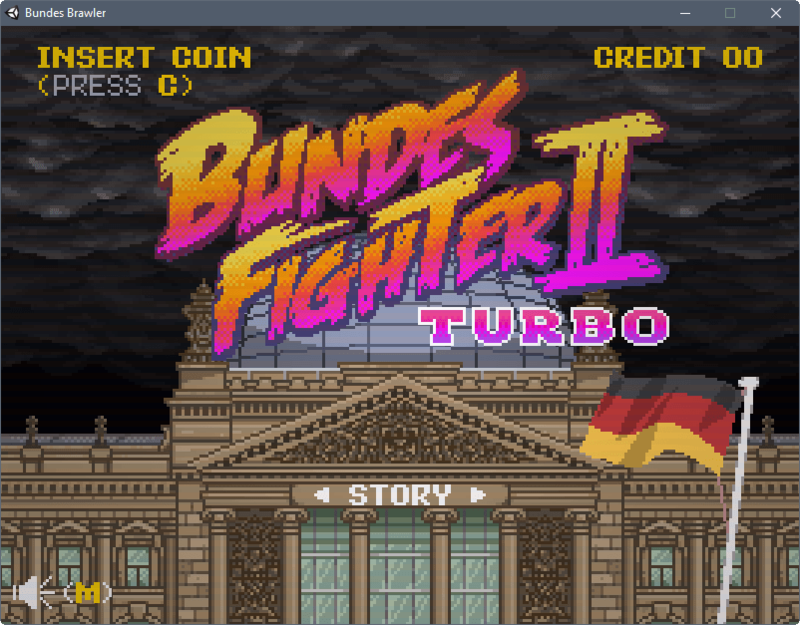 Bundesfighter II Turbo is a free Street Fighter II Turbo clone for Windows and Mac in which you play one of six major candidates of the upcoming German election. The game features a classic 16-bit soundtrack and design, and runs without installation on Windows. You need to insert a coin with a tap on the C-key to add credits and start playing. Once you have done so, you are asked to pick one of the six available candidates. Available for selection are chancellor Angela Merkel (CDU), the SPD contender Martin Schulz, Sarah Wagenknecht (Die Linke), Alexander Gauland (AFD), Christian Lindner (FDP), and Oezdehardt, a two-headed creature with the heads of Cem Özdemir and Katrin Göring-Eckardt (Grüne). Light Attack: C and I. Heavy Attack: V and O. The game is pure slapstick comedy and should not be taken seriously.It is full of insider jokes and dark comedy, but this appeals mostly to gamers who follow German politics. Each candidate comes with a unique set of moves and a special attack. 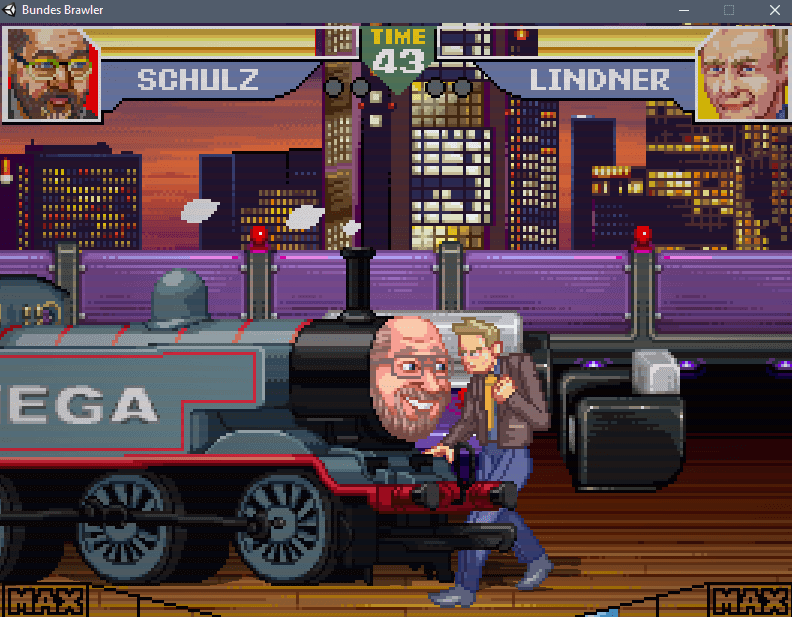 If you play Martin Schulz for instance, you can use the special attack to drive a train over the other candidate; Christian Linder's light attack opens a bottle of champagne, and Angela Merkel's special attack 1 summons former chancellor Helmut Kohl who falls on the opponent. You can play story mode, which pits you against all six candidates one after the other, or versus mode to play against another human player on the same machine. I thought long and hard whether to review Bundesfighter II Turbo or not. I made the decision to do so, but would like to make it clear that Ghacks is an apolitical blog. I don't want flamewars in the comment section, and will make sure of that. Stay on topic, talk about the game, the idea, and whether you think something like this is a good idea, or a bad one. Is it inspired from France’s Fiscal Kombat ? The game was released during the last presidential campaign by independent Mélenchon supporters. I don’t know, sorry. Similar theme though I guess. I’m curious… What is the meaning of Rudolf Steiner School and the candidates (it’s not a coincidence)? It was my primary school in my country. Hah, I won! Btw, it works directly in browser! No flash or any other plugins required. That’s all well and good but does it ad to my browsers hashing power? It seems ppl love to spoof Street Fighter these days. What do you mean by ‘ad to my browser hashing power’? It’s a Unity based game which works via HTML5. But it doesn’t use crypto mining if you mean this. Keep it up dude, I’m looking forward for more unique or hidden gems like such games. You review was not bad.